Some time ago it was announced the first Uranian Trojan was discovered , in L4 . Here's an animation of its motion in rotating frame to Uranus. The sim covers 6k years . An article of 2013 describes the long term evolution of this Trojan . 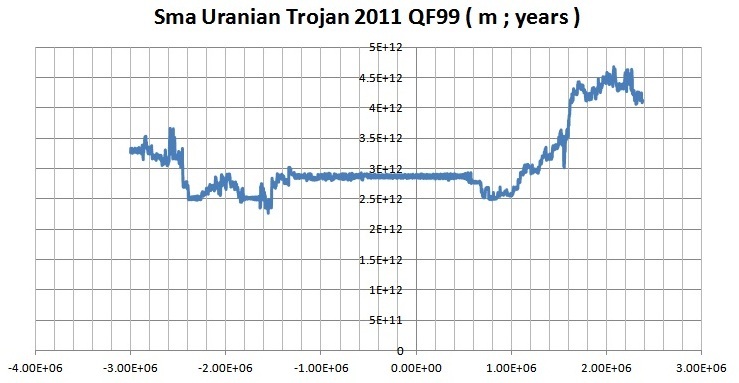 It seems to be a "temporarely" trojan to Uranus . I made a long term integration of this object in past and future . It seems to move from a tadpole orbit to a horseshoe orbit regularly in the future , so it was in the past . According to my sim it will escape the horseshoe orbit in about 600 kY from now , and never return again in the coming 3 My . Its orbit goes chaotically and will pass Neptunes orbit . In the past : it seems to have been a trojan for about 1.2 My to Uranus . Before that it also had a rather chaotic orbit , sometimes crossing Saturns orbit , as well as Neptunes orbit . My sim suggests that it became a trojan to Uranus due to a close encounter with Uranus at 0.14 AU around 1.3 MY in the past . From "above" the trojan does not seem to look as a real trojan in this animation . The sim covers 1 Mio years from now and shows Jupiter , Saturn , Uranus and Neptine , as wel as the trojan (in green) . Its orbit is well perturbed . After about 550 ky the trojan makes some close approaches with Uranus and looses its coorbital orbit from then on . It will not return as a trojan afterwards , whats more , after an even longer time it will cross Neptunes and also Saturns orbit .